Since returning from my holidays in Cambodia and Redang, I discovered to my horror that I have put on some weight. This is rather unusual because every time I go on a long holiday, I normally lose weight! Oh well, maybe I just had too much to eat this time around. Haha! It did not help that during this Raya holiday weekend, I did nothing but eat! Anyway, I have got to do some jogging again this week to start shedding those unwanted fats! Walking on a treadmill in the gym is just too plain boring for me. I prefer jogging in the outdoors and be close to nature, especially in the parks! So today I would like to share with you my Top 5 favourite parks in the Klang Valley. Forest Research Institute Malaysia (FRIM) located 16km northwest of Kuala Lumpur in Kepong is one of my favourite jogging spots. It offers 1,528 hectares of forest ecosystems, gardens, arboreta and wetlands with various trails (both tarmac and nature) scattered all around the Institute. It also has a 200m long canopy walkway that is built 30m above ground. 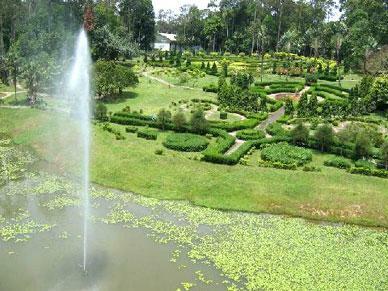 Taman Lembah Kiara Recreational Park is located in Taman Tun Dr Ismail in KL. It is a popular recreational spot for nearby residents. There is a beautiful man-made lake complete with fountains, a suspension bridge and a well-paved jogging path that absorbs the impact from running or jogging. One interesting thing you can see here is monkeys that roam freely all around the park. 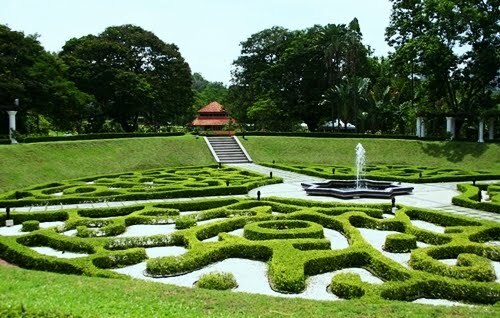 Also known as Taman Tasik Perdana, the Lake Gardens is located off Jalan Parlimen in KL. 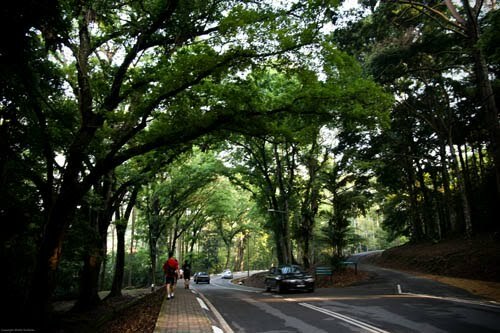 As the more popular green lung in KL, it encompasses about 92 hectares of greenery, which also include a lake, bird park, butterfly park, deer park, orchid and hibiscus garden, Tun Abdul Razak Memorial and National Planetarium. Malaysia's first Agriculture Park is located in Shah Alam, Selangor. The area, which is also known as Bukit Cherakah, covering 1,295 hectares of virgin jungle is the world's first agro-forestry park. There is a jogging track around a lake and a four-season house which showcases the four different seasons. Although not a park but a gated housing estate, Desa Park City is not only one of the best spots in KL to live, but also a great place to jog around its large beautiful lake! Besides jogging, you can also fly kites and go fishing. Or do some shopping at its Waterfront shops. There you have it, my top 5 recreational parks in the Klang Valley. Do you like jogging in the parks and which is your favourite park? Ouh...FRIM is near your home? 16km northwest of KL? Sounds quite near o.
I think I have been to Taman Lembah Kiara Recreational Park. :) But there, we don't have that many trees. You are so lucky. In Malacca, we don't have that many parks. :p Anyway I hope you can slim down asap. oh?? i have never been to any of the parks mentioned in ur blog! I don't like to go to the park... I like to go to the beach. Wah you travel quite a bit for jogging wor.. I haven't jogged before in parks in KL... Too lazy to go that far ler.. Plus I'm not really an outdoors kinda person :P I have been to Desa Parkcity and Lake Gardens though! Very nice parks! Wow. This is like Bluedreamer's Top Five. I like the view of Lake Gardens. I just wish that the plants are taller so that it would look a maze. Btw, have you gone back to FRIM to check out the lady that appeared on the tree? Very curious to know about that. Any update? KLCC park is one nice place to jog. Guests of hotels in the vicinity find it most convenient. 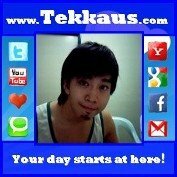 Tekkaus too early too early!!! I like lake gardens... never been there before but seen a lot of pictures of it.. I wonder if I can have my wedding pictures taken and not melt :P.
Lots of couples abused the parks these days behind the bushes! These days, there are no bushes and that's the ideal park! LOL. I hv only been to the Lake Gardens! i have never been to #1, 2, 3, 4 lol.. i love Desa Park City! Walao...so many comments here I read until I get a headache... >.<"
speaking of which, i rarely go to any recreational park. my form of recreation is shopping! hmmm, of all those parks, i've only been to FRIM, Taman Pertainian and Lake Garden only..
but then Taman Pertanian and Lake Garden, i think the last time i went there was almost 20 years ago lor.. haha!! as for FRIM, i still going there once in a while lor.. go there hiking in the morning, while i'm still able to have the stamina.. hahaha!! but i think only FRIM has the trekking facilities right?? i remember we go Lake Garden just to take photo, and Taman Pertanian just to cycle..
Oh...guys do bother too when they put on some weight ya. hehe...i thought only girls are worried. Of all the park above, I've only been to the bukit cheraka @ Shah Alam many years ago. I like FRIM too. Our local parks need to be well maintained. i've only been to Bukit Cherakah. i used to frequent the park every weekend when i stayed in shah alam. Thanks for this lovely post. It is a collection of the best parks you have visited. I have never been there but got this opportunity from your post. Take care. The best one is obviously the Desa Park City. The water body is fascinating and it makes the park look like an island. i went to Lake garden before. the others i havent visit yet. omg!